One Market has been doing a series of whole animal menus every week. We decided to give their duck menu a try. Every dish of the five course menu was made from Muscovy Duck. It had been a while since I last ate at One Market and it was nice to find that the place hasn't lost a beat. Yes, the decor and vibe is a little corporate, but that's what you would expect from a place located at the foot of a major office building. On to the food. 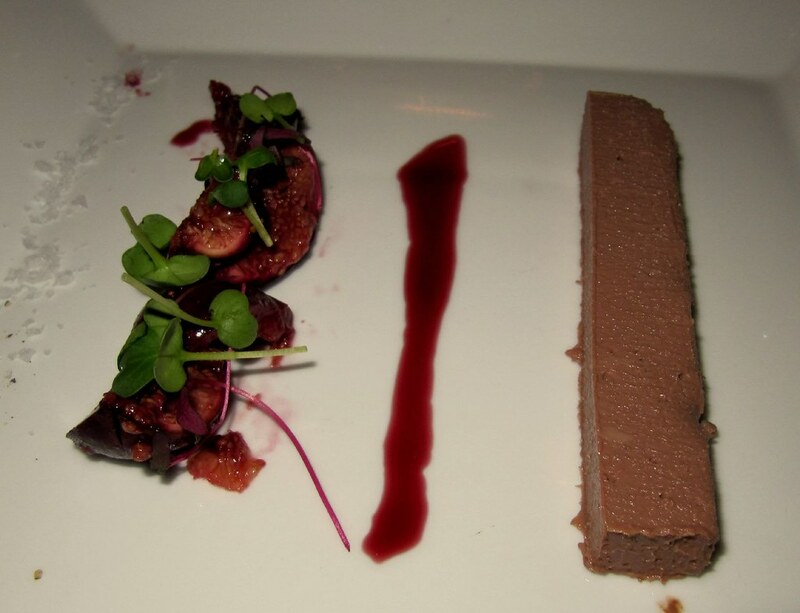 It started with the liver mousse terrine, a huge portion of creamy liver with a beautifully light texture served with pickled figs and a plate of their own brioche. Just what I wanted smooth strong livery goodness against the sweet tart figs. Next came the salad with a piece of duck proscuitto which was nicely seasoned and balanced, and a tender piece of gizzard that worked well with wild mushrooms. A good way to refresh the palate after being hit by the richness of the mousse terrine. The duck confit came as a small pile of leg meat surrounded by a red wine risotto. The confit showed of the deep duck flavor and risotto was a nice slightly acidic accompaniment. The fourth course was probably my favorite of the meal. Slices of duck breast with a huckleberry side and a spice gravy. The sweet potato pureee with vanilla had a surprisingly strong vanilla flavor, but everything worked well together. 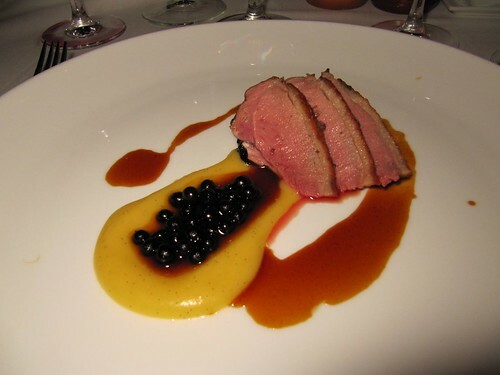 A slightly acidic sauce, the sweet huckleberries, the salty savory roasted duck and the base note of vanilla. 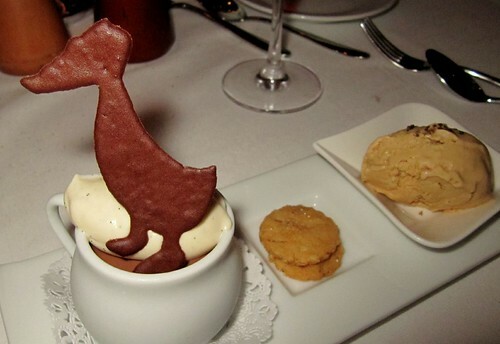 Dessert was a deeply satisfying pot de creme that perfectly contrasted with the vanilla bean cream layered on top, and a goofy little duck chocolate standing on top. The pot de creme with the side of salted caramel ice cream was a nice combination of creamy, salty and sweet. Copyright 2007-12 FoodBrood. All Rights Reserved.. Watermark theme. Powered by Blogger.